After recently being selected by the Princeton Review as a Best Midwestern College for the ninth consecutive year, the University of Michigan-Flint has received additional recognition from U.S News & World Report and G.I. Jobs magazine. The 2011 edition of Best Colleges by U.S. News Media Group, included UM-Flint in its Regional Universities ranking. The publication provides the most thorough examination of how more than 1,400 accredited four-year schools compare on a set of up to 16 widely accepted indicators of excellence. G.I. 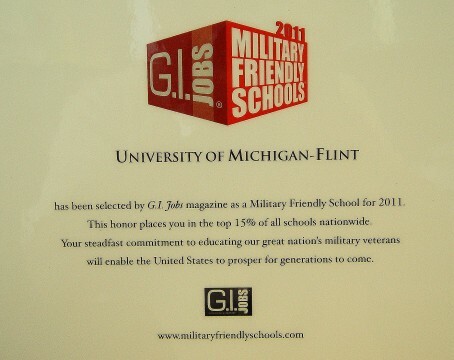 Jobs magazine has named UM-Flint as a Military Friendly School for 2011. According to the magazine, the honor ranks the university in the top 15% of all colleges, universities, and trade schools nationwide. A special Military Friendly plaque will soon hang in the Veterans Center. On Veterans Day 2009, UM-Flint dedicated a new center for student veterans that offers a centralized source of information and support for returning veterans, allowing a seamless transition. In fall 2009, the first freshmen-level classes designed specifically for undergraduates were offered to student veterans in their first year of college.